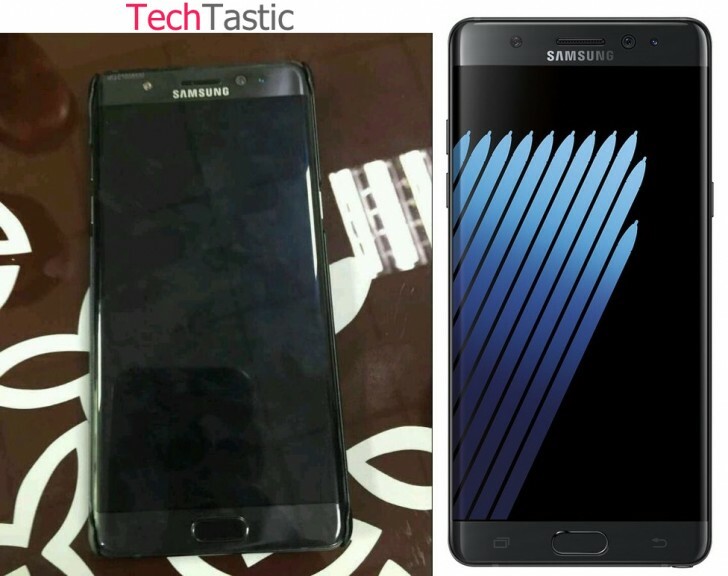 So far we've seen the upcoming Samsung Galaxy Note7 in quite a few pictures, sometimes based on certain schematics, and then even in official-looking press renders. But what about an actual photo of the device, caught in the wild somewhere? Well, here you go. On the left is the Note7 spotted doing its thing out and about, while on the right is one of those press renders - just so you can easily come to the realization that this is, in fact, the first ever 'live image' of the phone (even if it isn't turned on, unfortunately). To quickly figure out that the two images are of the same phone, just take a look at the sensor array housed in the top bezel - those three different lenses that are required for the Note7's iris scanner to work are present in both cases, and in the same places. The 'edge' screen is in too, so in the end it's entirely possible that we'll get the first ever curved-display Note this year. It should become official on August 2, then going on sale a week or two after the big event. Mass production is probably going to start this month, which means you should expect to see more and more of these live images popping up in the near future. Rumored specs for the Note7 include a 5.7" or 5.8" QHD AMOLED touchscreen, Samsung's Exynos 8893 chipset or the just-unveiled Qualcomm Snapdragon 821 (for some markets, including the US) at the helm, 4 or 6GB of RAM, the same cameras as the S7 and S7 edge (but possibly with improved software), all the usual connectivity options, a USB Type-C port, and a 3,600 or 4,000 mAh battery.